The desire among many EU citizens to devolve power from Brussels on matters such as migration and trade raises the question of how publics feel about politics in their own countries. We specifically asked about major political parties in each EU member state polled. We found that few political parties in Europe enjoy widespread appeal. The few that buck this trend tend to be more established parties in Western European nations that have not suffered as much economically in the years since the euro crisis. Sympathy for the frequently Euroskeptic parties to the right of the political spectrum is limited: In no country surveyed does more than about a quarter of the adult population hold a favorable view of parties such as France’s National Front, the Netherlands’ Party for Freedom (PVV) or Britain’s UK Independence Party (UKIP). In an already eventful year of elections, Germany will be in the spotlight this fall, with federal elections slated for September. The country’s two largest parties, the Christian Democratic Union (CDU) and the Social Democratic Party of Germany (SPD), enjoy some of the highest ratings – at least in terms of favorability – of any of the major parties asked about in the 10-nation poll. The SPD is judged favorably by 68% of Germans, while 58% gave a thumbs-up to Chancellor Angela Merkel’s CDU. In 2016, both parties received a positive review from 52% of the public. Ratings for The Left have risen 9 percentage points; still, only 37% view the party favorably. Few see the Alternative for Germany and the National Democratic Party in a positive light. 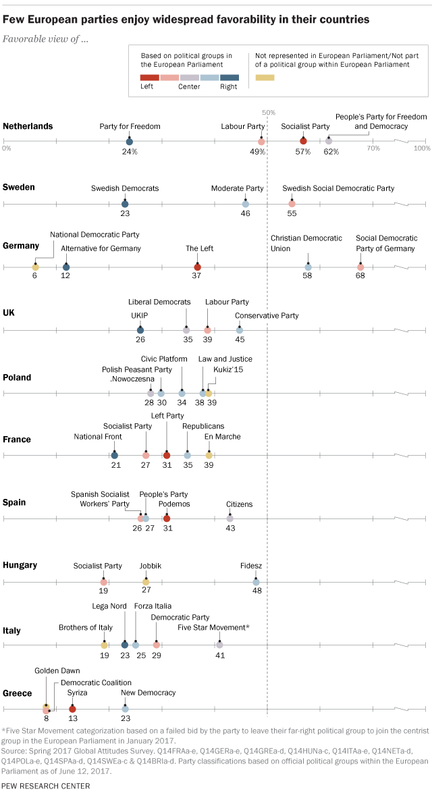 In the Netherlands and Sweden, established parties also enjoy more widespread appeal than their far-right counterparts. Dutch Prime Minister Mark Rutte’s People’s Party for Freedom and Democracy is seen favorably by 62% of the Dutch, while the Socialist Party is not far behind at 57%. Only 24% express a positive opinion about Geert Wilders’ right-wing PVV. In Sweden, the long-established Social Democratic Party receives favorable reviews from 55% of the public, while 46% say this about the traditional, center-right Moderate Party. The Swedish Democrats – a far-right party – are seen positively by 23% of Swedes. Traditional parties in the UK tend to be on less solid ground in terms of their general appeal to the public. Roughly two months before the June 8 parliamentary vote, 45% of Britons rated the ruling Conservative Party favorably, while 39% said this about the Labour Party and 35% about the Liberal Democrats. Roughly a quarter (26%) saw the right-wing populist UKIP positively. In Poland and France, relatively small shares of the public are positive toward the major parties asked about in the survey. Roughly four-in-ten have a favorable view of Poland’s ruling Law and Justice party (38%). In France, prior to the country’s presidential election, a similar percentage (39%) said the same about President Emmanuel Macron’s En Marche party. And France’s National Front is seen in a positive light by only 21%. That party’s leader, Marine Le Pen, finished a distant second to Macron in the second round of presidential elections in May. The two parties that have dominated Spanish politics over the past several decades – the Socialist Workers’ Party and the right-of-center People’s Party – receive lower ratings than the country’s two upstart parties, Ciudadanos (or “Citizens”) and Podemos (or “We Can”). Ciudadanos, which is viewed favorably by 43% of the public, draws more support from people ages 30 and older, as well as those on the right and center of the ideological spectrum compared with the left. Overall, 31% see Podemos favorably, with support for the party higher among people under 50 and those on the left. The populist Five Star Movement, led by former comedian Beppe Grillo, gets the highest ratings of any Italian party (41% favorable). The party gets better ratings among those in the center (50%) than among those on the political right (38%). Just over a quarter (29%) express a positive opinion about Italy’s ruling left-of-center Democratic Party of Prime Minister Paolo Gentiloni and former Prime Minister Matteo Renzi. All four Greek parties included in the survey receive low ratings, including Prime Minister Alexis Tsipras’ left-wing Syriza. Golden Dawn is viewed favorably by only 8% of Greeks.